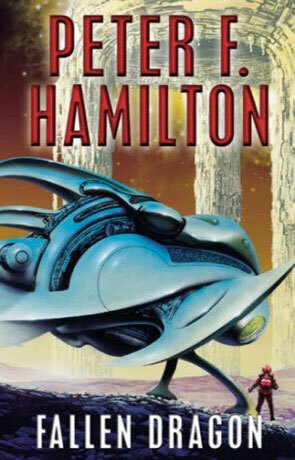 Fallen Dragon is a science fiction novel by the British author Peter F Hamilton. There is a unrecognised Science Fiction genre, that deals with the transition from a society of limits and into one of plenty (an utopia or nirvana, if you want). Or maybe not the transition itself but the events that leads up to the transition. In other words: the quest for the ultimate price. The transition phase it self is seldom described and what comes after is mostly just hinted at. The reasons for this are the usual paradoxes build into utopias. 1. Nobody has yet managed to think up one that it perfect for everyone (then we would instantly unit, in the task of reaching this common goal), 2. they are boring to read about ("Everybody was happy and content, yet never bored." Repeat ad nauseam) and 3. nobody really like change, they like the idea of change, but not the process it self. Pain and suffering make much better stories - we can associate with these feelings, a lot easier than the idea of eternal bliss. As you have probably already guessed, Fallen Dragon takes place in the time just before such a transition. We follow Lawrence Newton as he stumbles through the chaotic piece of crap that happens to be his life. We first meet Lawrence as a sullen teenager - rich kid, son of a local board member on the frontier planet of Amethi, Lawrence had a hard time fitting in, until he meet and fall in love with Roselyn. Things couldn't be much better, which pretty much means that something has to give. And something does. Lawrence runs away. The next time we meet Lawrence is twenty years later - he's a platoon sergeant in the Zantiu-Braun company 'asset realisation' army. ZB is on it's way to Thallspring, where they will try to "realise some assets" from the planet that hasn't been the lucrative investment that ZB had hoped for. Which in normal language means that they are going to steal everything of value. Not a noble job. And Lawrence has a plan to grab a bit for himself. What Lawrence doesn't know is that he's going to grab a dragon by its tail. Hamilton is back in style. He has created a new universe, new technology, new characters and manages to tell a complex and gripping story, totally independent from his former work. What surprised me the most about this book was how political it was in places. A normal defence, when science fiction is accused of being "just escape literature", is to say that SF is really a, more or less subtle, critique of present conditions. Fallen Dragon goes for the throat and attacks a lot of highly held ideologies and ideas. I found this quite refreshing and Hamilton manages to do it without being preachy or without coming on to hard. For Hamilton fans this is a must read. If you haven't read any Hamilton before, this is a good place to start. Written on 1st September 2001 by TC.